Responsibly skipper, crew or Bareboat charter an inboard auxiliary powered cruising sailboat within sight of land to a port or an anchorage during daylight hours in moderate to strong wind and sea conditions. This course qualifies for ASA 104 Bareboat Charter Certifications! After successfully completing this course you will be certified to rent or charter a sailboat of approximately 50 feet in length, locally, the Caribbean, Florida, the Bahamas, or just about anywhere. We only teach this important, one week course on the ocean. A local lake simply isn’t sufficient to learn the skills necessary to be Bareboat Certified. You need the experiences of tides, tide currents, freighters, channel markers, buoys, fishing vessels, draw bridges, and so on…. You will actually experience these, not just talk about them. A Bareboat skipper is responsible for the boat and for the lives of the crew. This is a responsibility we do not take lightly. Bareboat certification is designed for experienced sailors with some cruising experience (this is a requirement of ASA). The Bareboat skipper needs the wisdom to safely handle a large sailing vessel. Our standard includes extensive knowledge of boat systems, maintenance procedures, general boating etiquette, and emergency procedures. The beauty and splendor of the ocean also brings potential hazards. Coral, rocks, and shoals are an everyday occurrence in many waters. Modern conveniences fail with alarming regularity in this salt water environment. With proper training and experience, most problems can be turned into minor inconveniences. This Bareboat Certification course is designed to prepare you to meet these challenges and continue on your journey. Vacation while you learn. 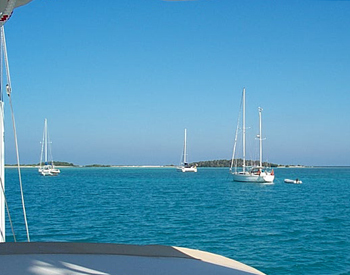 Our Bareboat certification course is taught in exotic locations. This includes exciting areas such as the Caribbean, the San Juan Islands & Puget Sound, the Bahamas, and The Florida Keys. As situations develop (as they always do!) you will learn how to deal with them. No two courses have ever been the same. Your best-made plans will change on a continuing basis. The real trick is learning to deal with problems while continuing to enjoy yourself. Upon successful completion of the course, you will receive the ASA Bareboat Cruising Certification (ASA 104). 6 days & 5 nights aboard a 40 to 50 foot auxiliary Sailboat. These Lessons are taught on a private basis to ensure a solid foundation. We allow a maximum of two students per boat. However, this is a live-aboard course and is somewhat like a vacation. You are welcome to invite up to two guests to share this unique experience with you for no additional charge. Your guest will act as crew and will not receive certification. These are private lessons and are scheduled individually!